Duplex stainless steel (DSS) 2507, also called super-duplex stainless steel (SDSS), is one of the newest members of the modern duplex family. Owing to the high levels of its various constituent alloying elements, DSS SAF 2507 exhibits an exceptional combination of high mechanical strength, high toughness, high corrosion resistance and superior resistance to chloride pitting. However, the high levels of alloying render it a very poor machinability. 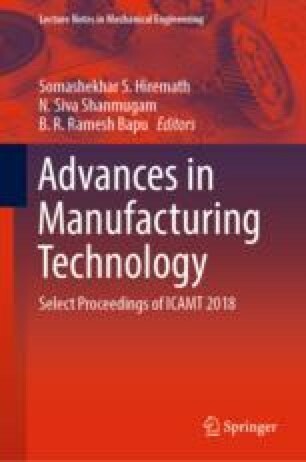 This study discusses machinability of SDSS SAF 2507 for milling operation under a range of machining parameters. The temperature generated during milling is studied for both dry and wet conditions. Area surface roughness of the milled surface is also measured under varying cutting speeds and feed rates. Predictive models are developed using two approaches that are Response Surface Methodology (RSM) and Artificial Neural Networks (ANNs). Optimization of the cutting parameters to obtain maximum surface finish is done using Genetic Algorithm (GA). From the analysis, it is observed that feed rate has the most significant effect. We would like to thank Department of Science and Technology (DST), Govt. of India, and Centre for Precision Measurements and Nanomechanical Testing, Department of Mechanical Engineering, National Institute of Technology Calicut, for providing us the facility purchased under the scheme FIST—No. SR/FST/ETI-388/2015.